Provide the easy to use content authoring solution to your faculty and staff, which integrates with any Learning Management System and enhance the teaching and learning experience in your district today! SoftChalk, LLC has structured a consortium pricing arrangement with SCOLC that enables all districts in member counties to subscribe to SoftChalk Cloud with phenomenal savings. By joining you can realize in excess of 60% savings—and as more districts join your savings increase! It’s easy to get started, just contact sales@softchalk.com today! SoftChalk Cloud enables educators to easily create their own rich, interactive, online learning content, and learning object repository in which they can manage and share their content. Content is accessible, mobile-ready and portable for use with any learning management system. Hosted content can be linked to multiple courses in multiple LMS’s. SoftChalk lessons and activities are mobile-friendly and work great with iPads, Androids and many smart phones. When content changes are needed, just make them once in SoftChalk Cloud and all courses are updated simultaneously! Content and media resources can be shared publically or privately with individuals, groups or the entire SoftChalk Cloud community. (SoftChalk Cloud Flyer). Curious to try SoftChalk Cloud? Get a FREE 30-day Trial and experience SoftChalk Cloud for yourself! Interested in seeing SoftChalk Cloud in Action? 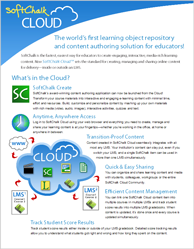 Register for a demo and learn how SoftChalk Cloud’s award-winning learning object repository and content authoring platform can help you create portable, interoperable content that works with any learning management system. Need more information on SCOLC pricing? * SCOLC Schools Districts include the Offices of Education for Imperial County, San Diego County, Orange County, San Bernardino County and Los Angeles County.